Thanks for checking out our "Puppy Care Tips" Page! The following links are reccomended resources for learning more about basic puppy care and training tips. There are MANY more resources and books available to you, please take the time to do your research and be prepared before taking on the adventure and challenge of raising a new puppy! 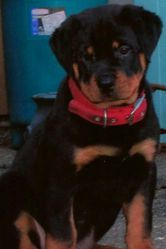 The following information and links are from "A Love of Rottweilers" a fantastic website and a wealth of information on Rottweilers and raising a Rottweiler puppy! Taking care of a puppy takes a lot of time, effort, patience and money. Your baby Rottweiler has the potential to grow into a wonderful dog, but right now he's just a little pup who needs you to look after him! Puppies are just like babies and they depend on you for food, shelter, love and protection. Although a puppy is a lot of work, and is definitely a big commitment, it's also lots of fun and very rewarding! That little furball in your arms will be an adult in no time, so make the most of these 'puppy days' and start off the right way by learning how to keep your little guy (or girl) happy and healthy. Taking care of a puppy, won't be overwhelming, or worrying, if you know the basics. If you've raised children you'll have a vague idea of what's in store, if not, you may want to consider this your preparation for becoming a parent! To fulfil these puppy care needs, YOU are going to need to invest a fair amount of time and effort, tap into your resources of patience, and dip into your wallet. It's a sad fact that many pups find themselves abandoned or turned over to rescue centers or pounds because their owners didn't realize that they had needs. Puppies are not cuddly toys who sit quietly waiting for you to find time for them! They need to be supervised at all times, fed 3 times a day, taken outside to 'potty' every hour, exercised, played with .... and much more, so be prepared. One of the first things you need to consider when taking care of a puppy is what you're going to feed him. 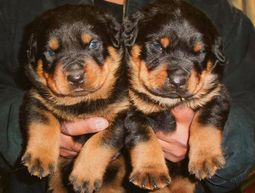 Rottweilers are a large to extra large breed and physically Rottie pups grow very quickly, although they mature quite slowly. Their rapid growth puts considerable strain on their bones/joints and ligaments, and they need optimum nutrition in order for their musculo-skeletal system to develop properly. Large breed puppies need a puppy food that is high in nutritional value, but not high in calories. A food that is too calorie-dense will promote the rapid growth which leads to health issues. There are some excellent foods on the market today, but stay away from generic store-brand foods and do plenty of research before deciding what to feed your pup. 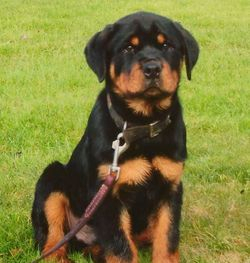 Rotties are also a breed that tends to be susceptible to canine allergies. A food that contains a lot of additives, chemicals, fillers and so on will not only cause growth and development problems, but may trigger allergies. One of the major challenges new puppy owners face when taking care of a puppy is the housebreaking issue. Puppies aren't born knowing that they need to eliminate outdoors. In fact, as far as they're concerned anywhere (with the exception of where they sleep) is fair game! 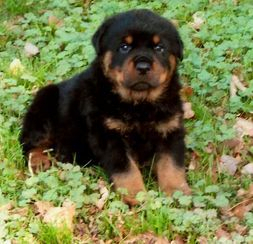 Teaching your baby Rottweiler that he needs to pee and poop outdoors ONLY, is something that has to be a priority on your 'Taking Care Of A Puppy To Do List'. Although housebreaking a puppy can be a challenge, using a crate can make the whole process much quicker and easier. Crate training puppies is a very effective method of potty training, because it works WITH the pups natural instincts not to mess where it sleeps. Here is a link to some info on the ideal housebreaking method. The keys to successful housebreaking are patience and consistency. Puppies are very much creatures of habit, and it's much easier to teach them the correct habit in the first place, than it is to have to break a 'bad habit' and re-train them at a later date. 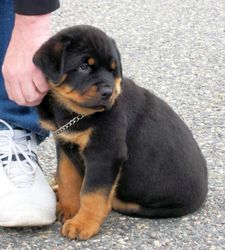 Making sure that your Rottweiler puppy doesn't get a chance to have 'accidents' indoors, learns to control his bladder/bowels, and becomes familiar with an appropriate 'potty spot' are all very important from Day 1! Taking care of a puppy means that his health and wellness is totally your responsibility. Luckily, there are some very simple, but effective ways of keeping your little guy safe and happy. One of the most important of these is to make sure that he gets his puppy vaccinations on time. Puppies are very susceptible to several serious, contagious dog illnesses, and the only way to protect them is through a regular vaccination program. Usually puppies get their first set of shots at around 7 weeks of age, and then two more sets, given at three week intervals. These vaccinations protect against Distemper, Hepatitis, Leptospirosis, Parainfluenza and Parvovirus. There are other 'optional' vaccines that may be given, depending on where you live, and then the Rabies shot is mandatory in the US and is usually given when your pup is somewhere around 16 weeks old. Other important parts of puppy health care include preventing and treating canine parasites including canine worms, fleas and ticks, mites and more> Then there's grooming, diet and ongoing preventative veterinary care. Unfortunately no matter how careful you are in taking care of a puppy, accidents and illness can (and do) happen! If your pup was to become seriously ill, or be injured, would you have the finances to cover his veterinary bills? Even if they were $3000, $4000 or more? If you don't, or you'd rather spend your savings on a vacation or new car, I'd strongly recommend getting some dog healthcare insurance for your Rottweiler. Take a look at my Health Insurance For Your Dog page to learn how pet insurance could be a lifesaver for you and your pup. The three areas above are probably the most vital parts of taking care of a puppy, but there's so much more to this adventure! Your baby Rottweiler is like the proverbial 'blank slate', he's just waiting for you to teach him everything he needs to know. 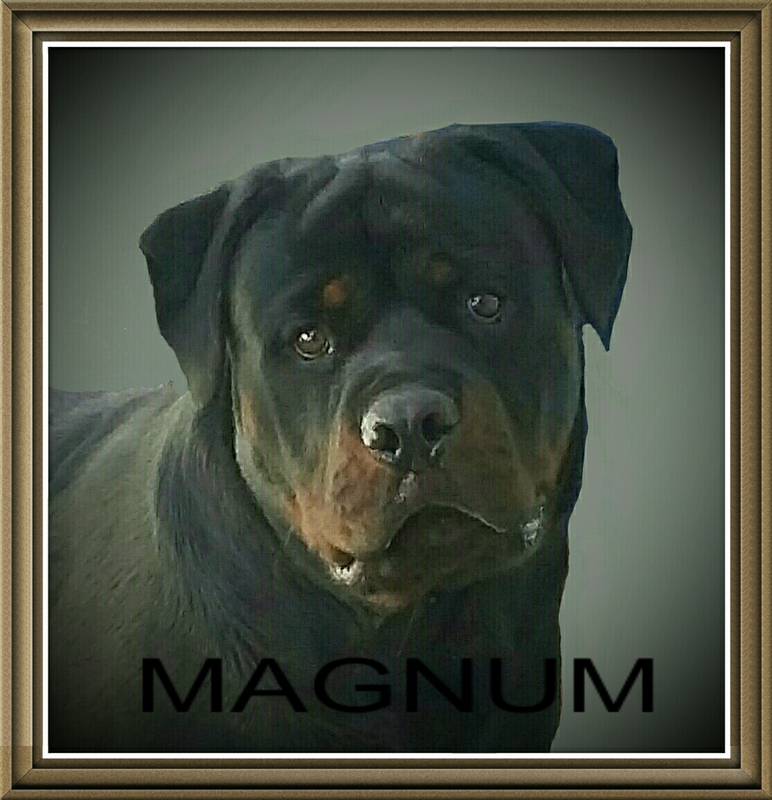 BUT REMEMBER..... Rottweilers are very intelligent dogs, and if you don't show him what's acceptable, and help him to learn right from wrong, chances are he'll make up the rules for himself - and you won't appreciate them. You can begin to teach your pup to recognize and respond to his name and some basic obedience commands such as 'Sit' and 'Stay' as soon as you bring him home. He'll be very anxious to please you and will learn quickly. Check out my FREE puppy training tips for lots of help with training your pup. Help the 'bonding' process between you and your baby Rottweiler by spending time playing with him, teaching him and just cuddling with him. Rotties have a tendency to think that they're lap dogs (even when they weigh 120lbs, so your little guy needs your attention). These dogs are very sensitive and loving, so never use harsh words or punishments if your pup does something wrong. Only use positive encouraging training techniques, and shower him with praise, love (and a few tasty treats won't go wrong!) when he's successful at anything.